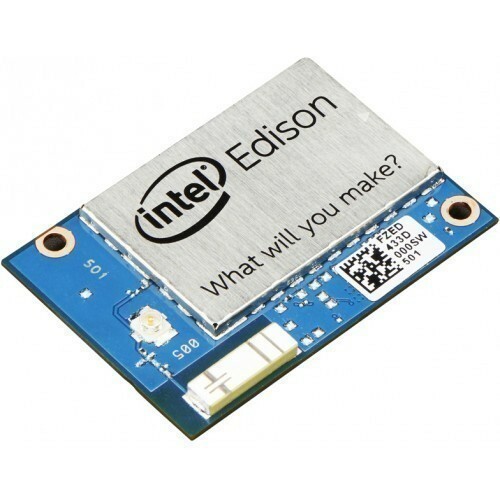 The Intel® Edison is a compact computing platform that's small by design so you can easily integrate it into projects. It's primarily designed for "Internet of Things" projects and is pretty powerful for its small size. The Edison has a bunch of features that makes it appealing for makers of all skill levels. It uses a 22 nm Intel SoC that includes a dual core, dual threaded Intel Atom CPU at 500MHz and a 32-bit Intel® Quark microctroller which runs at 100 MHz. It's a lot of power for a board that's about the size of an LED Matrix. The board supports 40 GPIOs and includes 1 GB LPDDR3, 4 GB EMMC, and has dual-band WiFI and BTLE - which makes it essentially wireless.